Barbat, A. H.; Vargas, Y.; Pujades, L.G. ; Hurtado, J. The main objective of this article is to assess the expected seismic damage in reinforced concrete buildings from a probabilistic point of view by using Monte Carlo simulation. To do that, the seismic behavior of the building is studied by using random capacity obtained by considering the mechanical properties of the materials as random variables. 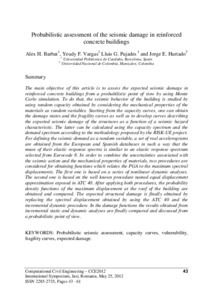 Starting from the capacity curves, one can obtain the damage states and the fragility curves as well as to develop curves describing the expected seismic damage of the structures as a function of a seismic hazard characteristic. The latter can be calculated using the capacity spectrum and the demand spectrum according to the methodology proposed by the RISK-UE project. For defining the seismic demand as a random variable, a set of real accelerograms are obtained from the European and Spanish databases in such a way that the mean of their elastic response spectra is similar to an elastic response spectrum selected from Eurocode 8. In order to combine the uncertainties associated with the seismic action and the mechanical properties of materials, two procedures are considered for obtaining functions which relates the PGA to the maximum spectral displacements. The first one is based on a series of nonlinear dynamic analyses. The second one is based on the well known procedure named equal displacement approximation exposed in ATC 40. After applying both procedures, the probability density functions of the maximum displacement at the roof of the building are obtained and compared. The expected structural damage is finally obtained by replacing the spectral displacement obtained by using the ATC 40 and the incremental dynamic procedure. In the damage functions the results obtained from incremental static and dynamic analyses are finally compared and discussed from a probabilistic point of view. Barbat, H. [et al.]. Probabilistic assessment of the seismic damage in reinforced concrete buildings. A: International Symposium Computational Civil Engineering. "Proceedings of the 10th International Symposium Computational Civil Engineering: Iasi, Romania - May 25th, 2012". Iasi: Societatea Academica, 2012, p. 43-61.